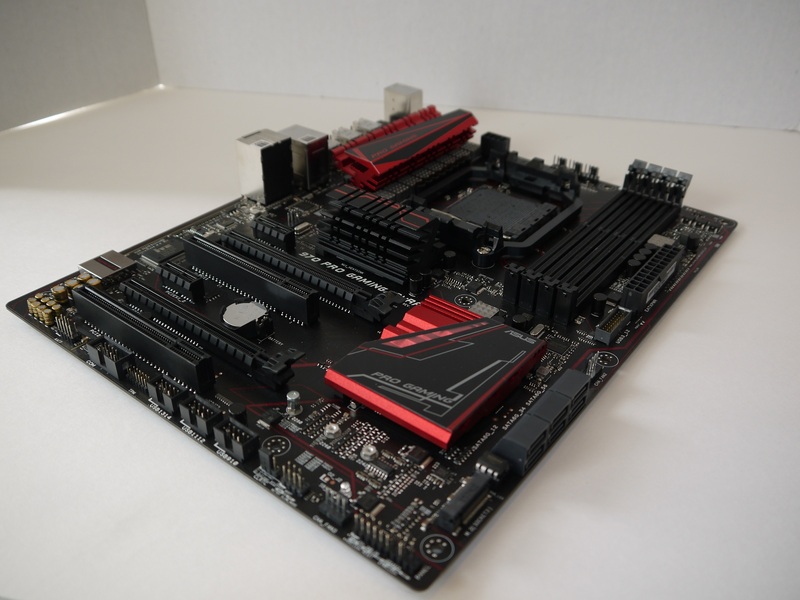 Today we’ll have a look at the ASUS 970 Pro Gaming/Aura AM3+ motherboard. It’s been quite some time since we’ve seen anything new in the AMD camp and change is always welcome. The 970 Chipset isn’t new but ASUS has come back with a nice set of features to update this platform. On top of that they’ve packaged them in a very nice looking, all new board. 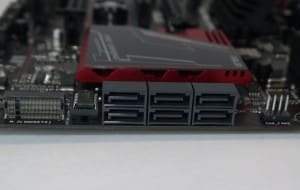 With the new AMD socket nearly a year away, it’s nice to see some new AM3+ motherboards with added features such as USB 3.1 and M.2 SSD functionality. One other interesting tidbit is the new Aura feature which allows the user to customize color and rhythm of the on-board RGB LEDs. For those who enjoy a bit of bling, this should be right up your alley. This looks like a very promising board to me. The power section is 8 phase but, the way I understand it, it uses a “7+1” layout instead of the typical “6+2” layout. This means it has 7 phases dedicated to the CPU and one for the CPU-NB, which should give it a bit more gas in the tank. 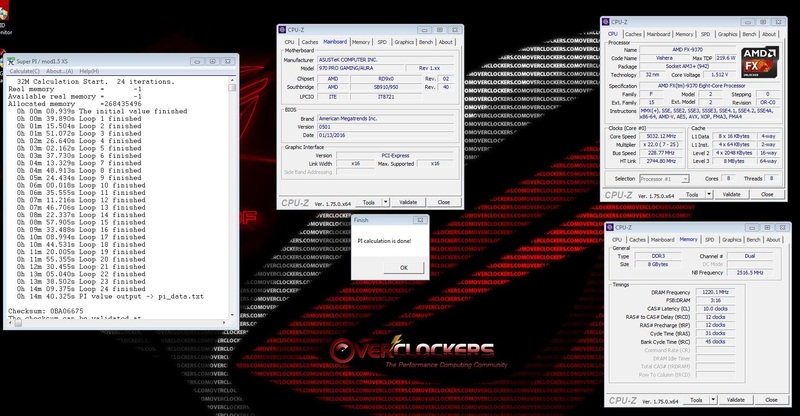 This is one area mid-range boards will typically suffer and ultimately limit their overclocking abilities. 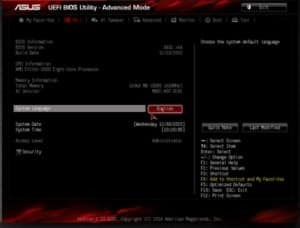 The CPU support list also claims compatibility for the big FX-9 series CPUs with their huge stock 220W TDP, despite the specifications listing the board at 125W. Needless to say I’m excited to see what this board can do! 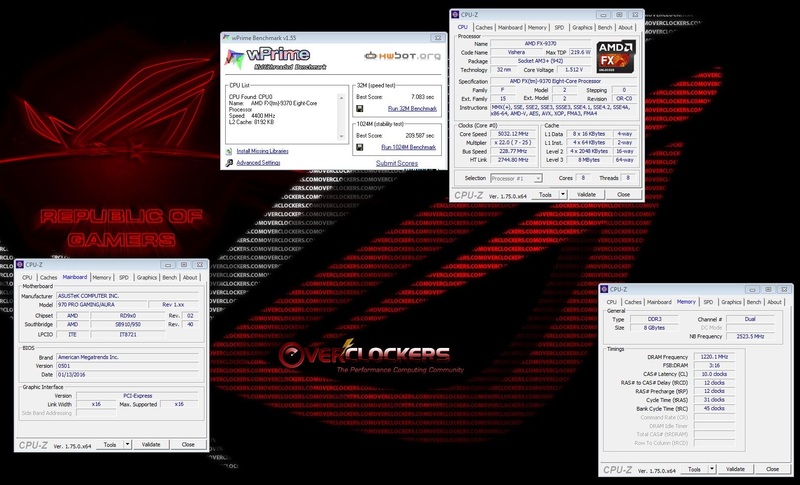 The ASUS 970 Pro Gaming/Aura motherboard supports AM3 and AM3+ CPUs although some of the older ones will be limited in memory speed because of the chip’s built in IMC. 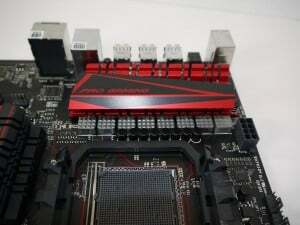 The board has four DIMM slots supporting Dual Channel DDR3 2133MHz (OC). Check the QVL for compatibility. 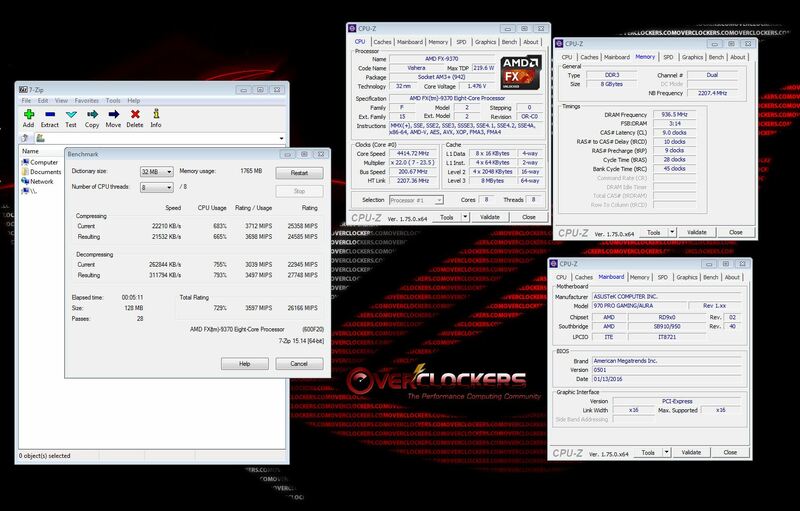 There are six SATA III 6Gb/s ports supported by the AMD SB950 controller and one M.2 socket 3, M key which supports PCIe 2.0 x4. Check the QVL for compatibility of M.2 drives. These drives come with different “keys”. I know the Samsung 950 Pro does work even though it’s not on the list. There’s a total of 18 USB connections, 8x USB 2.0, and 2x USB 3.1 (type A) on the back panel. The rest need to be routed from the board including the USB 3.0 which would require a cable to connect to the front of the case. 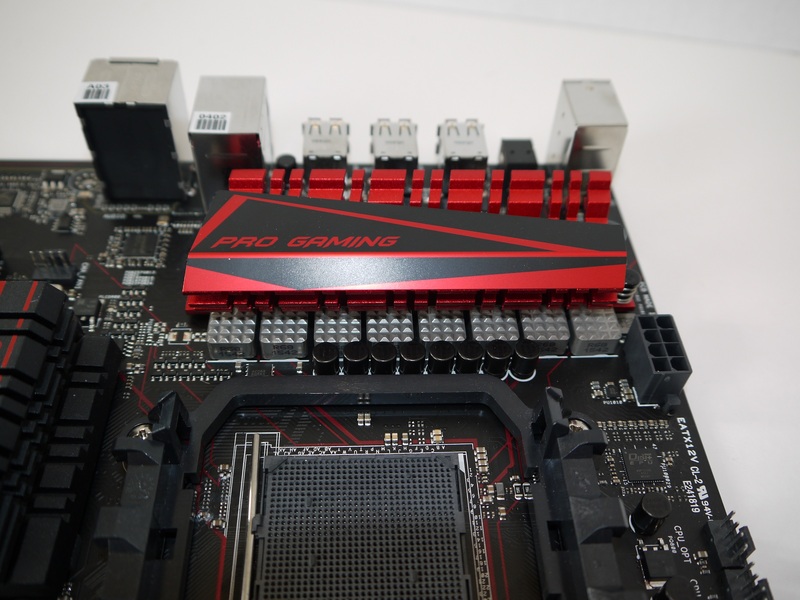 The ASUS 970 Pro Gaming also supports PCIe 2.0 at x16 or SLI/CFX at PCIe 2.0 x8/x8. 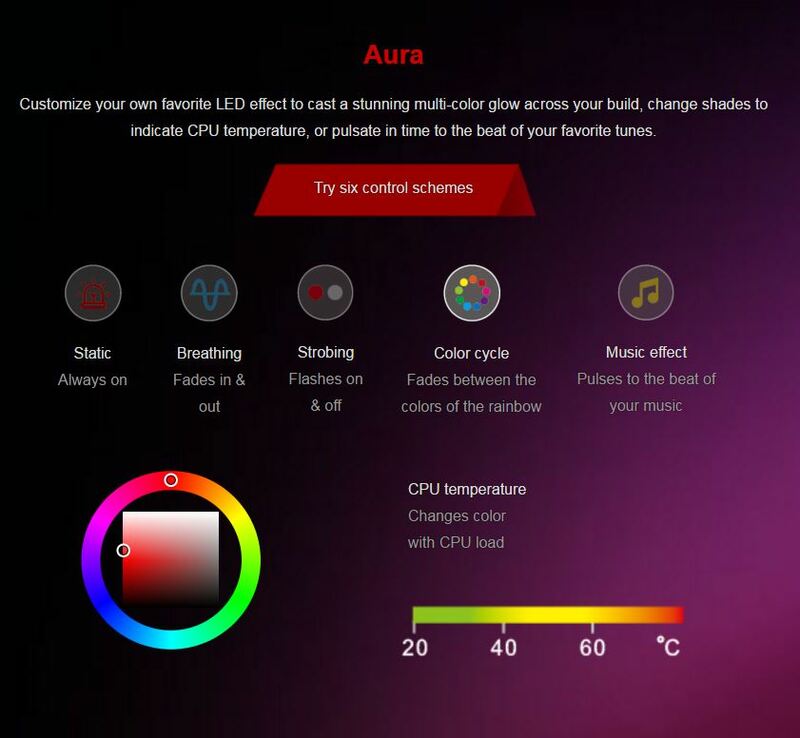 Then there’s a new feature ASUS brings to the table which is AURA, a customizable RGB LED system which emanates from the Southbridge heat sink. 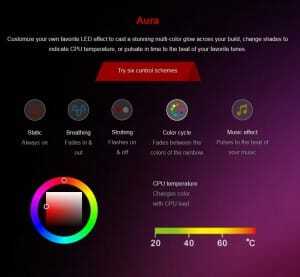 Below is a full list of specifications and features taken from the ASUS 970 PRO Gaming/Aura Product page. As part of the “AURA” product line, the 970 PRO has RGB LED illumination under the South Bridge heat spreader. The bundled driver disc also includes software which gives the user control over these LEDs with nearly a limitless combination of colors and sequences for customized lighting effects. The software also include presets which will pulse to the beat of your music or even set it so the color scales according to CPU temperature. 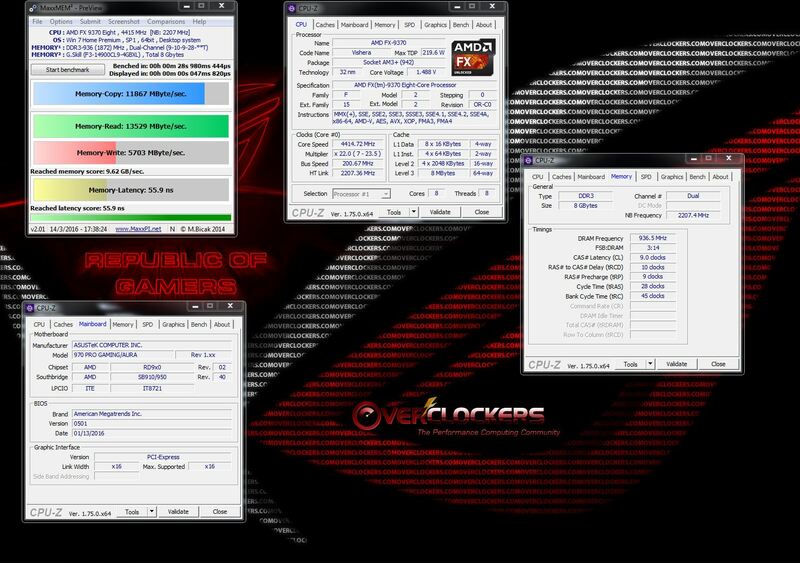 First off the ASUS 970 Pro Gaming/Aura provides enough power for a decent overclock with their 8 phase design. 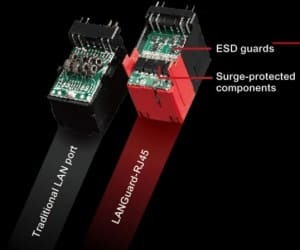 ASUS has incorporated “superior chokes that operate up to 13.6% cooler, for extra durability” and “10K capacitors from Texas Instruments, engineered to resist extreme temperature variations of between -70°C and 125°C”. 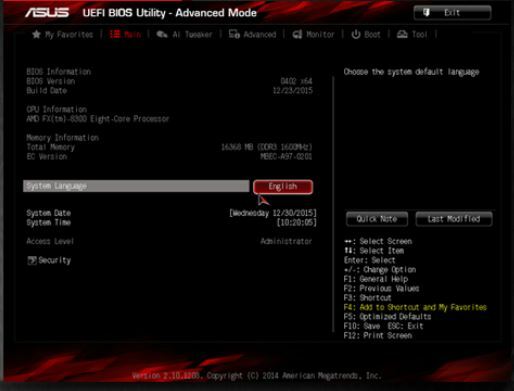 All the options needed in the BIOS are there such as Load Line Calibration to help maintain a steady voltage and CPU/CPU_NB Current Capability when just a bit more power is needed. 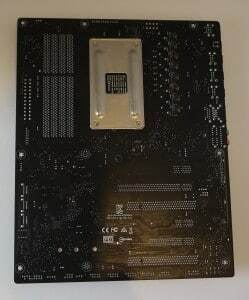 I installed the FX-9370 into the board, enabled the D.O.C.P. memory profile, and left all other settings on auto. The board fired right up and was completely stable. 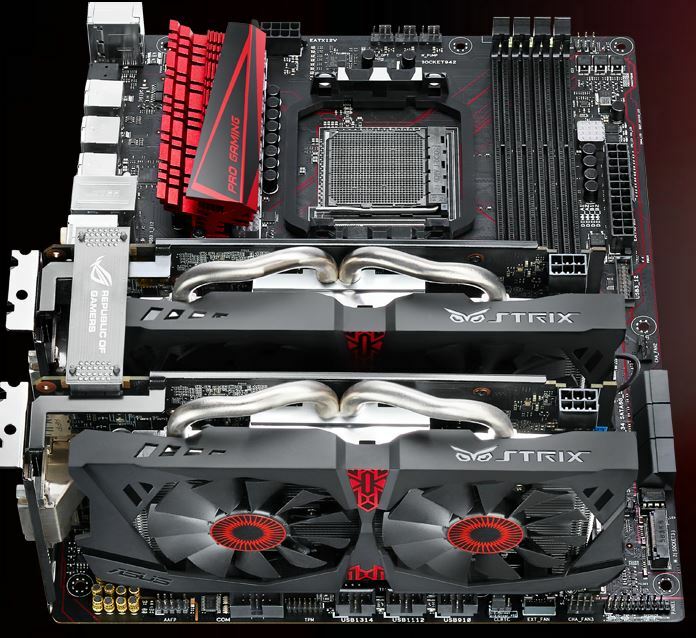 Being a “Gaming” board it’s worth mentioning the ASUS 970 PRO Gaming/AURA is the first AMD 970 board with official Nvidia SLI support as well as AMD’s Crossfire X. According to the ASUS site this platform will support 2-way quad GPU. This should tackle any game with ease. 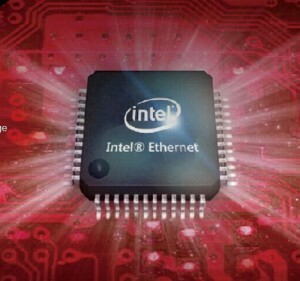 ASUS has also equipped this board with an Intel Gigabit Ethernet (I211-AT) LAN which reduces CPU load and offers exceptionally high TCP and UDP throughput. 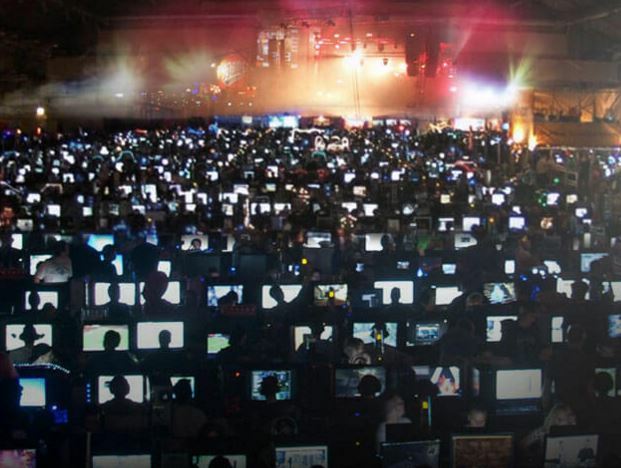 This reduction in CPU workload leaves more power for your gaming. 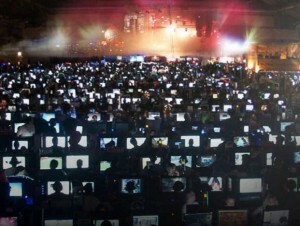 Bundled with this is their Game First IV Beta software, which optimizes traffic for lag free online game play, and LANGuard, added protection to the LAN connection for “1.9X-greater tolerance to static electricity and 2.5X-greater protection (up to 15KV) against surges”. ASUS-exclusive SupremeFX technology for near loss-less audio delivered by the Realtek ALC1150 codec. Along with their shielded design and EMI cover, ASUS has equipped the board with premium Japanese made Nichion capacitors for clarity and fidelity and a 300Ω headphone amplifier. To go with the premium sound is Sonic Radar II, an onscreen overlay to help you identify the enemy. Particularly useful when they are out of the line of sight. “Become the hunter not the hunted”. It’s nice to see some AMD boards being equipped with next-generation storage interfaces such as USB 3.1 and M.2 SSD for improved transfer times. There are two USB 3.1 Type-A on the back I/O panel which yield up to 10 Gbps. 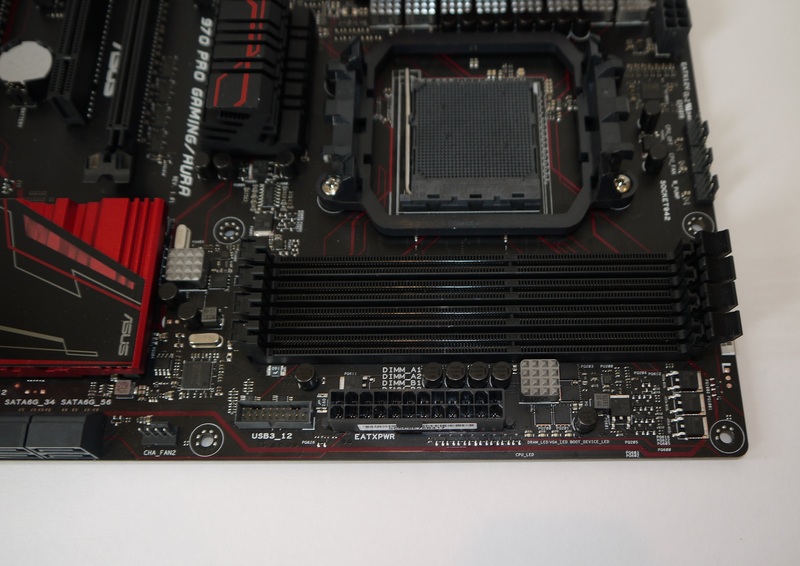 The ASUS 970 PRO Gaming/AURA is also equipped with a M.2 socket nestled below the South Bridge heatsink. This socket supports the M key type NVMe SSD’s with transfer rates up to 16Gbps. As I mentioned earlier the Samsung 950 Pro NVMe works just fine in this slot. Worth noting, if you want to install Windows 7, you will need to incorporate the NVMe driver during the installation process or Windows 7 will not see the drive. For the full features and specifications see ASUS 970 Pro Gaming/AURA overview webpage. Fine-quality, super-tough components are our watchwords. We fit only superior chokes that operate at up to 13.6% cooler, for extra durability. We also use 10K capacitors from Texas Instruments, engineered to resist extreme temperature variations of between -70°C and 125°C! Digi+ VRM voltage-regulator module (VRM) is one of the finest in the industry, ensuring ultra-smooth and ultra-clean power delivery to the CPU at all times! 4 LEDs indicate problems with the CPU, memory, graphics card or boot device for quick diagnosis. ASUS-exclusive SupremeFX technology delivers high-fidelity, near-lossless audio no matter how frantic your game becomes. The purity and stability of the remarkable 115dB signal-to-noise ratio (SNR) is assured, with a shielded design, electromagnetic-interference (EMI) cover and voltage-protected 5V power supply. Supreme FX’s superior components, including the trusted Realtek ALC1150 codec, maximize acoustic performance and eliminate interference – so you hear only the very best from your gaming headset or speakers! 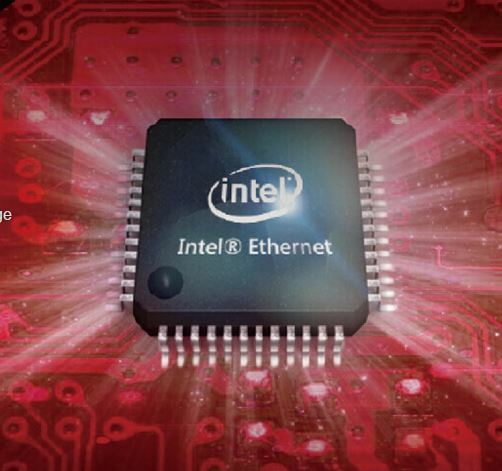 Featuring the very latest Intel Ethernet (I211) for faster, smoother gaming — always. Intel’s LAN has the serious double advantage of reducing CPU overhead and offering exceptionally high TCP and UDP throughput. This significantly reduces the processor’s workload, so there’s more power for your game and your gameplay. GAMING EXPERIENCES970 Pro Gaming/Aura is the planet’s first AMD 970 chipset-based motherboard to receive official certification for compatibility with NVIDIA™ SLI™ for truly epic graphics and gaming. It also supports AMD® CrossfireX™ . So, choose your weapon for up to two-way, quad-GPU graphics supremacy — and give your 970 Pro Gaming/Aura rig maximum gaming performance, visual excellence and gameplay thrills! RGB LED ILLUMINATIONGaming is about your style, your personality — and your passion. 970 Pro Gaming/Aura is the gaming motherboard that lets you inject passion to project your style and personality in full color! Aura, our all-new LED-illumination technology, lighting up an endless spectrum of color combinations coupled with a selection of fascinating and fun effects. The smoothest, slickest mouse-controlled graphical BIOS has been improved to make it even more appealing. 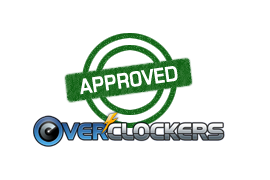 Whether you’re a PC novice or a seasoned overclocker, the EZ and Advanced Modes help you find your way. In EZ Mode you can get set up very quickly, applying the date and time, and fan profiles. Switch to Advanced Mode to set up favorites and shortcuts, record and review recent changes with Last Modified or make notes in Quick Notes. 970 Pro Gaming/Aura is built for play, shaped by professional gamers and tested for gaming perfection — strong enough storm through the industry’s most punishing labs workouts. We engineer and test for the finest quality, longevity, performance, stability and compatibility. Our world-class engineers are themselves avid gamers, and combine their own passion with the skills and demands of some of the planet’s best players to create innovative gaming features everyone will crave. With 970 Pro Gaming/Aura you do more than just play — you’ll experience gaming on the edge of reality. In the next set of slides you’ll see the retail packaging for the ASUS 970 PRO Gaming/AURA. On the front we see Windows 10 ready and NVidia SLI certified logos, RGB AURA theme. On the back, there’s a list of the main specifications and some of the features offered by the 970 PRO. Opening the box, we’ll see the board comes in an anti-static sleeve, nestled into a cardboard divider, well secured and protected. Under the divider are the included accessories. 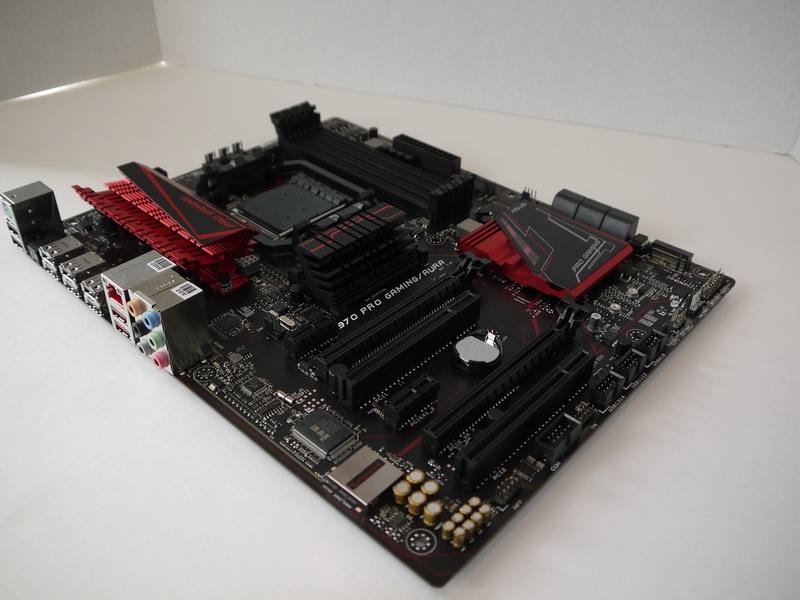 ASUS has continued their red and black theme on this board. Very black heavy, though, the only red is on the heat sinks, FX shielding, and the illuminated line, the rest of the board is black. Very appealing and clean looking. 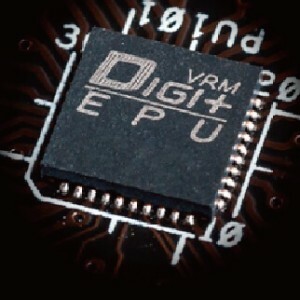 Moving to the back of the board we’ll see a line of 8 VRM chips. 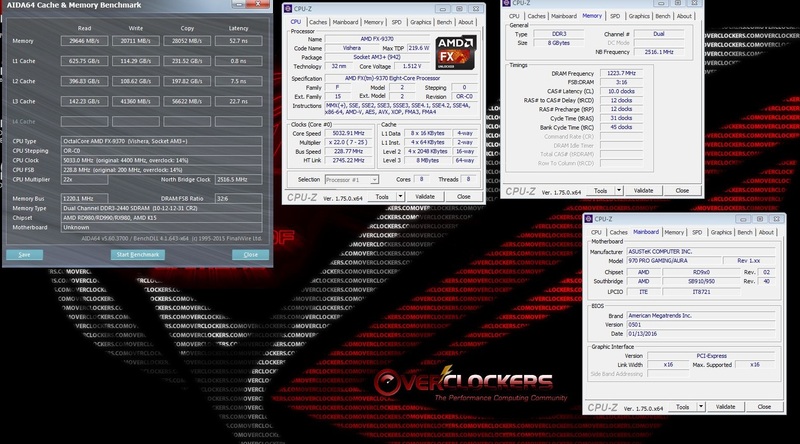 This is why, for AMD, good circulation behind the motherboard is helpful in controlling temperatures. We can also see the electrical breakdown of the PCIe slots at x1/x16/x1/x8. 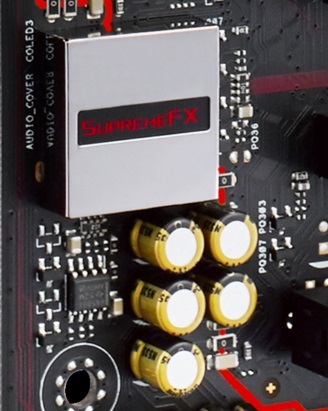 Moving in a bit closer to the bottom left of the board we see the Supreme FX logo on the EMI shield which protects the Realtek ALC1150 audio chip. Directly beneath the shield are the Premium Nichion Gold audio capacitors. Like most boards these days the audio section is isolated from the rest of the board to help reduce interference. ASUS includes the red line shielding which reduces interference and adds to the customizable lighting. In the center of the board are the PCI/PCIe slots; two full length PCIe 2.0 x16 slots for SLI/CFX and two PCIe 2.0 x1. 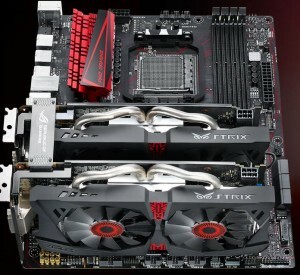 ASUS also included two PCI slots for additional connectivity. Moving along the bottom of the board from left to right we’ll find the front panel audio connector which supports HD and legacy AC97 standards, a serial port, TPM module port, and three additional USB 2.0 ports. Let’s have a closer look at the right side here. 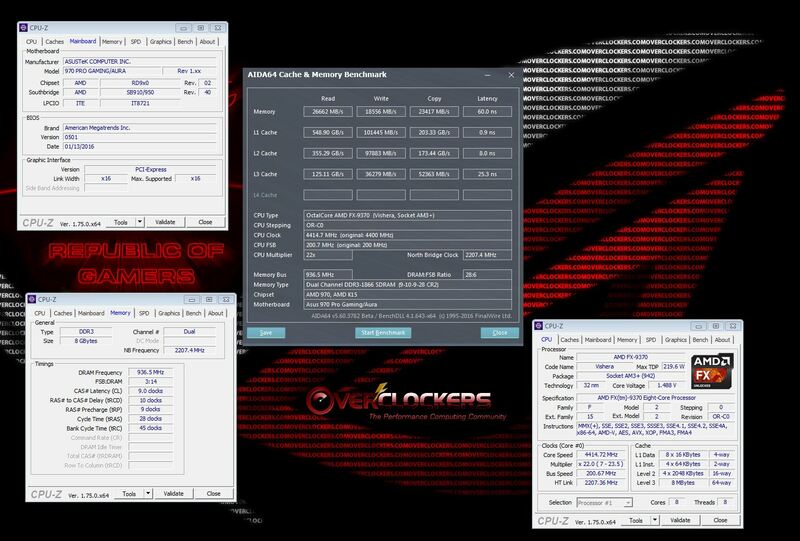 Located beside the CMOS jumper is something I haven’t seen before which ASUS calls their “Overclocking Jack”. These jumpers support the features Re-try, Safe Boot, and Slow mode by shorting the corresponding jumpers with a metal object or a jumper cap for about five seconds. Next to this is your typical front panel connector and directly above we find the M.2 socket 3. This socket supports M Key type 2242/2260/2280 storage devices up to PCIe 2.0 x4. Let’s continue on the the right side of the 970 Pro. Here we have six SATA 6Gb/s ports for your storage devices and right beside the EATX 24-pin power connector is a USB 3.0 port for additional connectivity. Directly behind these are the four DIMM slots supporting up to 32GB of DDR3. Moving to the socket we can get a good look at the power delivery system. We’ll see the superior chokes that operate 13.6% cooler and the 10K capacitors from Texas Instruments, engineered to resist extreme temperature variations. We’ll also find the EATX 12v, 8-pin connector located directly beside the chokes. 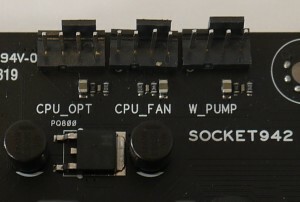 We’ll also see three of the six on-board PWM fan headers, one of which is conveniently designated for a water pump. 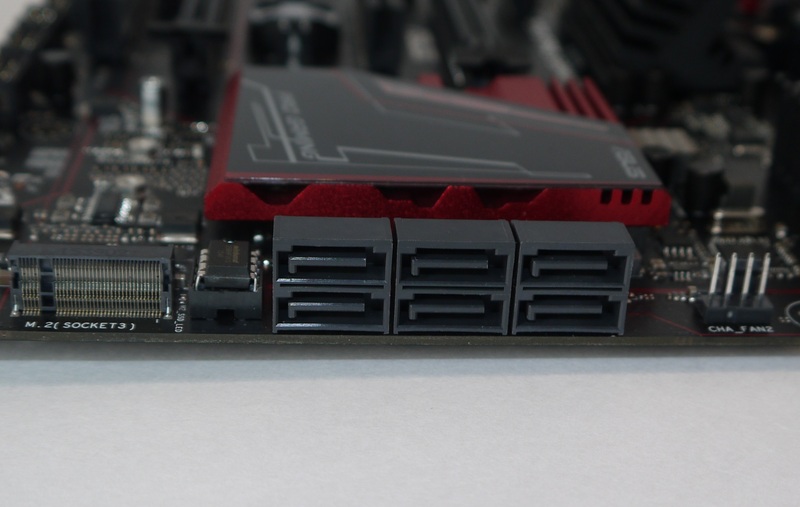 Last up on our up close and personal tour of the ASUS 970 PRO Gaming/AURA is the power section. 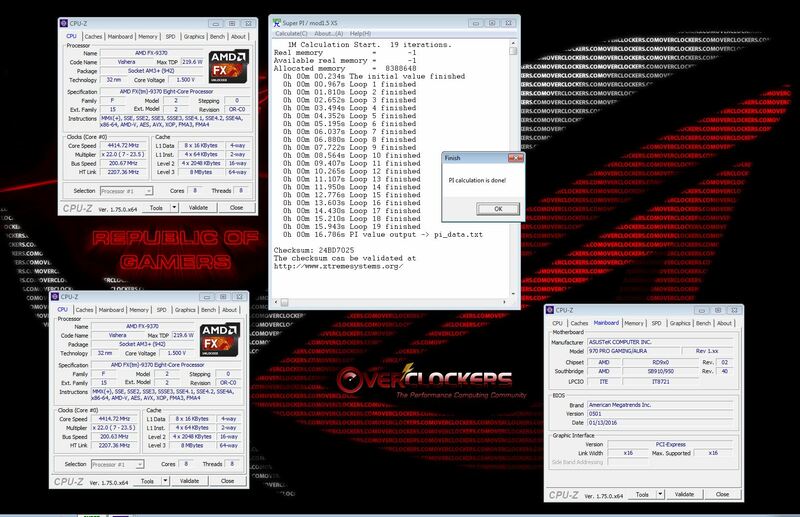 Here we see a full 8 phases powering the CPU and IMC, as you can see ASUS doesn’t use any doublers here. Next to this is the heat sink showing good contact with the chips for efficient cooling. Here are a couple slide shows for you. First are some of the on board ICs and a few pictures in the dark. Personally I have always been a fan of ASUS BIOS. Could be it’s just familiar, but I find it easy to use, with an intuitive layout. 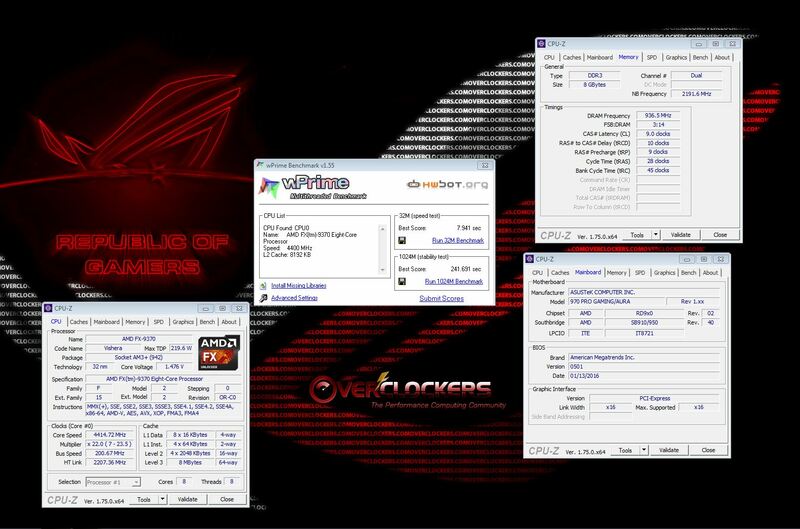 For any who are familiar with AMD overclocking, you’ll find everything you need in the BIOS of the ASUS 970 PRO Gaming/AURA to push your CPU to the end of your cooling. Looking through the slides you’ll see there is ample control over voltage and power settings. Plus features such as EZ flash for updating BIOS file and Profile slots for saving that perfect overclock. One thing for certain it won’t be the BIOS limiting the CPU. 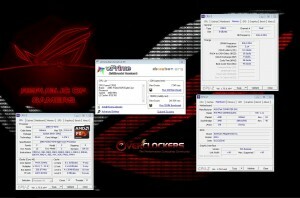 On to the software ASUS has bundled with the motherboard. I won’t mention all of them since there are many, but will touch on a few of my favorites. First up is AISuite3, this software has been around a long time with steadily increasing reliability and control. Today it gives you the ability to control your CPU and GPU speeds and voltages, fan profiles, and system monitoring. They’ve also included TurboV on the disc which is one of my faves. 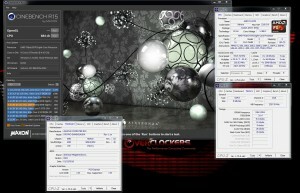 This is a lightweight program perfect for software overclocking when pushing to the extreme (LN2). I’ve also included a shot of the AURA interface. It gives you control over the on-board RGB LED’s and there really is no limit to the color possibilities. Add to this the presets for strobing, breathing, keeping the beat to your music, or scaling in color to your CPU temperatures. 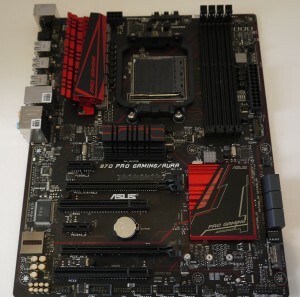 It’s quite a sharp addition to the ASUS line of motherboards but as always for those who don’t care for the “bling” this can be disabled in BIOS or with the software, leaving the choice up to you. I’d like to add a couple pics here for information only. 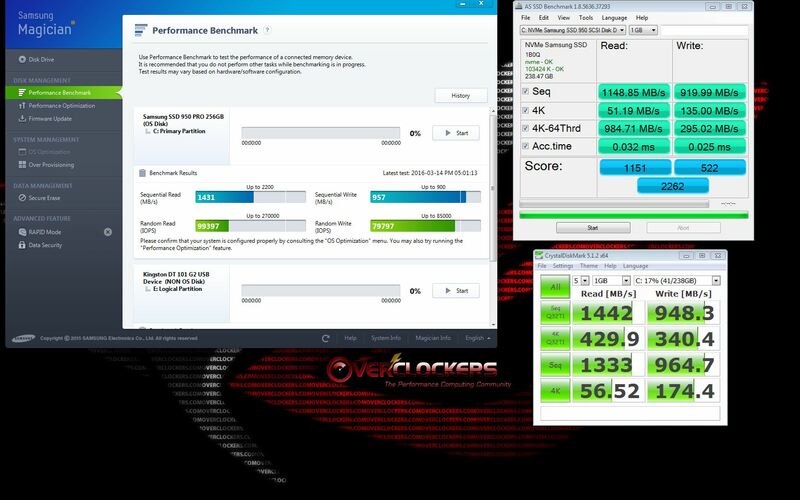 One is the performance of the Samsung 950 Pro NVMe and secondly a shot of Catzilla 720p. 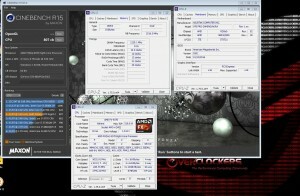 Overall I had a very good experience with the ASUS 970 PRO Gaming/AURA. It’s a well rounded motherboard with some updated features such as USB 3.1 and M.2 SSD connectivity. This should help bridge the gap until ZEN arrives and give AMD enthusiasts a much needed refresh. 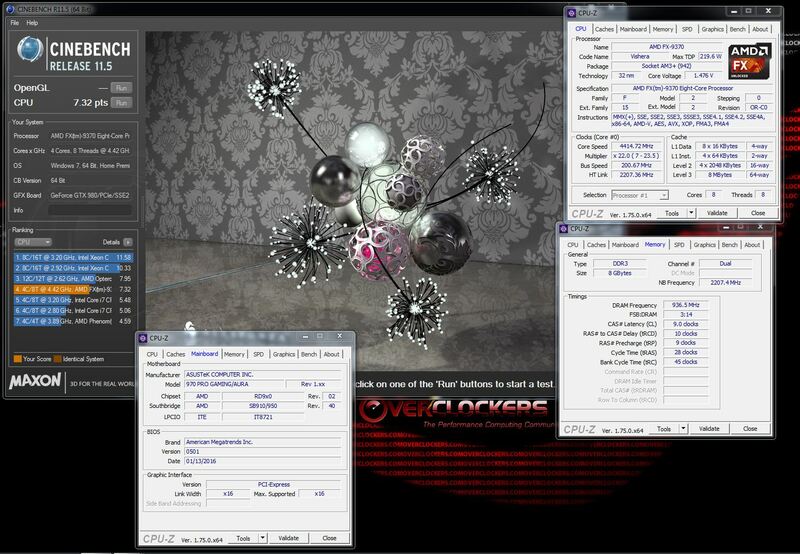 The 970 Pro has enough power for decent overclocks and handled itself quite nicely in my opinion. Keep in mind this is a 125W board so even running the FX-9370 at stock is impressive, let alone at 5GHz. 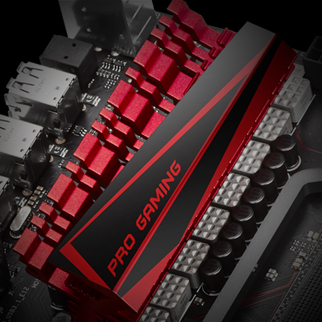 Pricing for the ASUS 970 PRO Gaming/AURA falls into a very good bracket at $119.99 @ Newegg.com which is very reasonable for a motherboard with a great set of features and more than capable of holding it’s own for the price point. Add to this the RGB LED lighting and just all around good looks, this board definitely gets the Overclockers.com stamp of approval. Board looks promising Shawn nice job! Indeed, it would be nice if they sent one out to Shawn so he can put it through the wringer. Got my fingers crossed guys. Yeah if this was out half a year ago, I'd have probably picked one of these up instead of my UD5 R5. Looks pretty nice! It is. Overall for the price it's a good board. 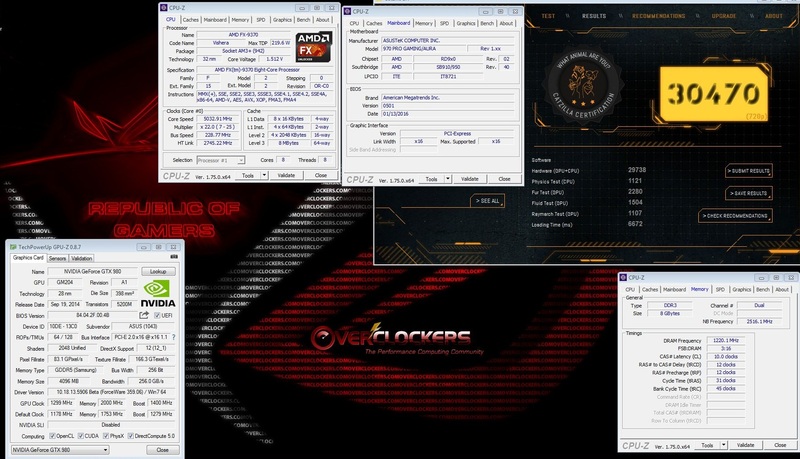 I believe the ASUS 970 PRO Gaming/AURA will meet my needs for at least 5 years, paired with a FX-8350 running at just over 4.1GHz, this combo was an upgrade from an ASRock 970M Pro3 & FX-6300, will install the latter in a 'less important' build, or use as a LInux Mint one. I've actually been debating on getting this board for a cheap gaming build i'm thinking of doing. Great write up Johan. Shawn, I was reading the review and had a question. You showed benchmarks with the FX-9370 OC'd to 5.0 ghz. 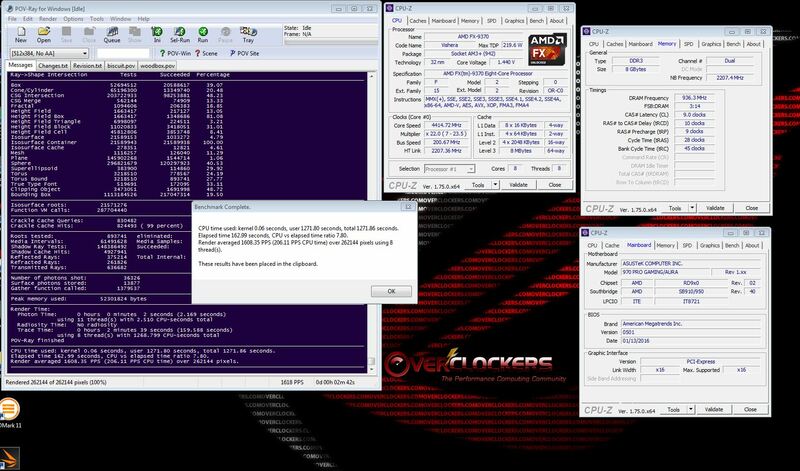 Did you also stress test the system at that overclock level for any length of time? And what were you using for a CPU cooler? Maybe I missed those details. 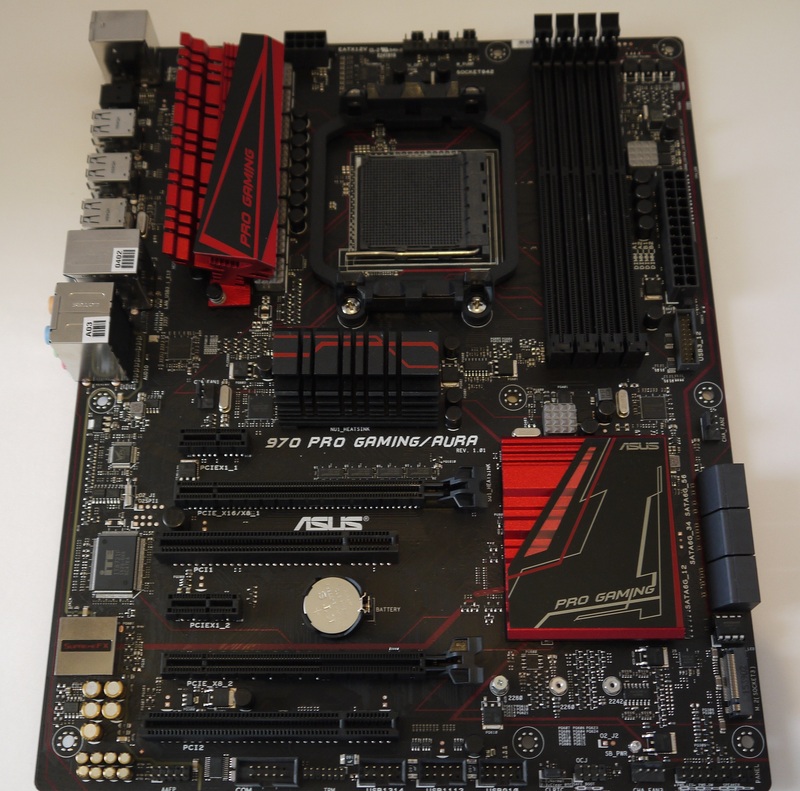 Also, I do't see the FX-9370 listed in the CPU support list for this motherboard on the Asus website. I wonder if they have removed it. 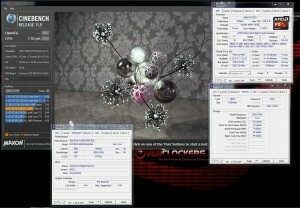 The FX-8370 is listed, however. 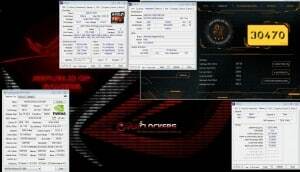 Asking these questions because Egg has a great sale on both the FX-9370 and the 970 Gaming Aura right now. That would have been on water and that 9370 needs less than 1.5V at 5.0 to be stable. I did a quick 20 minutes of P95 just to verify but I had run that CPU so many time Trents I know what it likes and doesn't like. 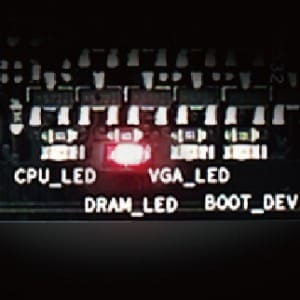 The 9370 has no "official" support, the board is rated for 125W. My intention was to show the capabilities of the 970 Gaming by pushing it with a high TDP CPU and it runs just fine. The only issue I ever had with it was the NB chips gets pretty hot right around the 7 GHz mark with a high CPU_NB speed. 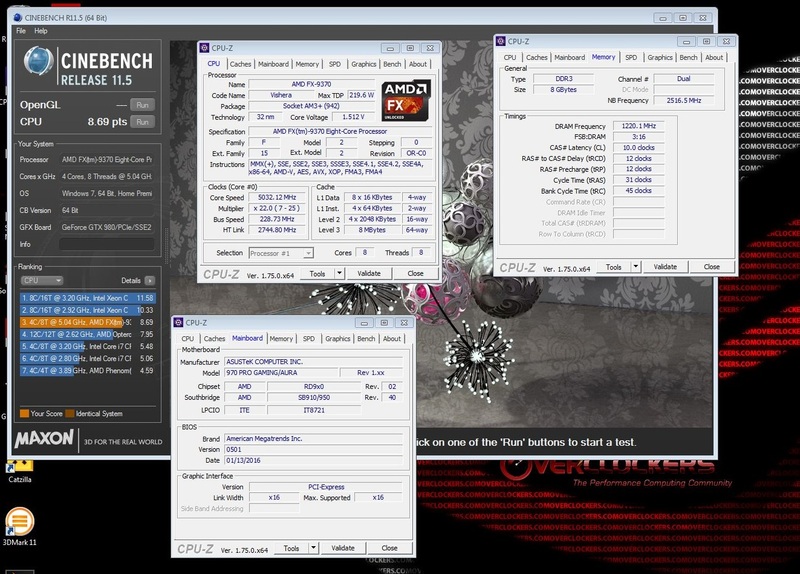 That would have been on water and that 9370 needs less than 1.5V at 5.0 to be stable. I did a quick 20 minutes of P95 just to verify but I had run that CPU so many time Trents I know what it likes and doesn't like. The 9370 has no "official" support, the board is rated for 125W. My intention was to show the capabilities of the 970 Gaming by pushing it with a high TDP CPU and it runs just fine. The only issue I ever had with it was the NB chips gets pretty hot right around the mark with a high CPU_NB speed. Did you mean 5 ghz? 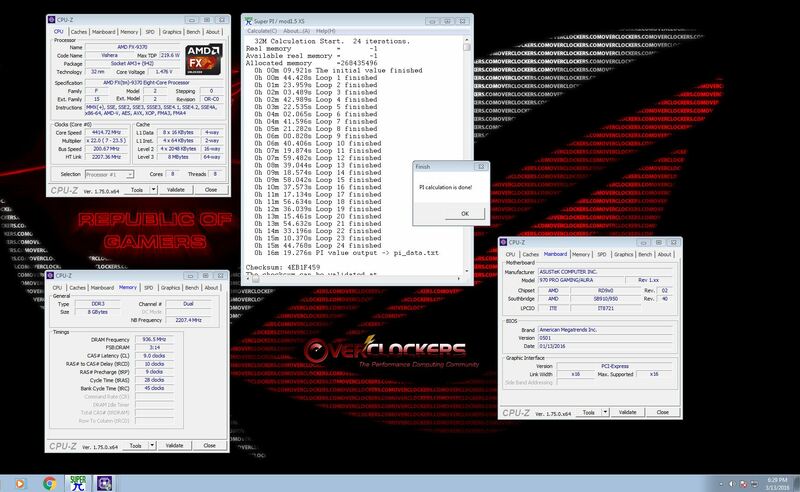 Reason I was asking about the 9370 support was that I found threads on other forums where people had paired the FX-9370 with that same board and it wouldn't even post. Was the board you reviewed a retail sample? A sfar as I know it is Trents. It has serial #s so I can RMA if needed. I have had boards (CHVI) that came without so when it dies I pay. 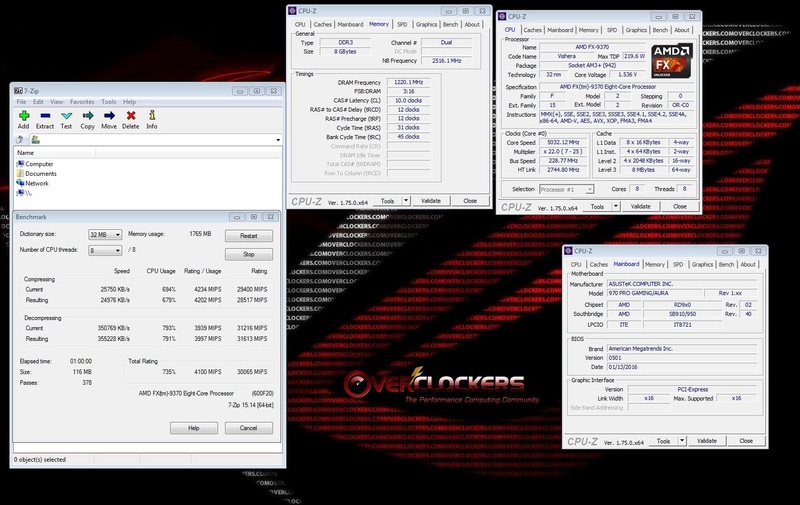 No I meant 7GHz I took it cold with the 9370 just to see how the VRM handled things but it was the NB that was the weak link to me when I say hot I mean hot. As for 9370 support never once had the board bark at me or refuse to post. When I had it there were only two BIOS available. I have had the 9370 in the M5A 99FX PRO R2.0 as well and it ran fine. Not sure why they were having issues.